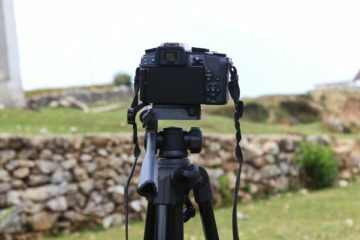 Best Benro Camera Tripod Reviews 2019 - Where To Buy Them For Less? 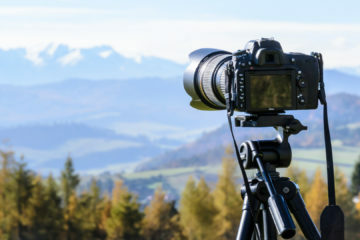 Though you might feel more like an amateur than a professional when you reach for your camera, using a tripod can make you feel like a pro. No matter how much experience you have, a tripod can keep you from taking blurry photos and pictures that cut off heads or other parts of your shots. 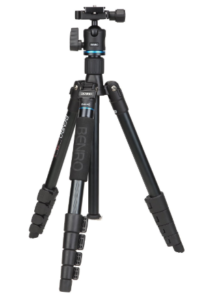 Benro makes some amazing tripods that come in prices that will fit any budget. 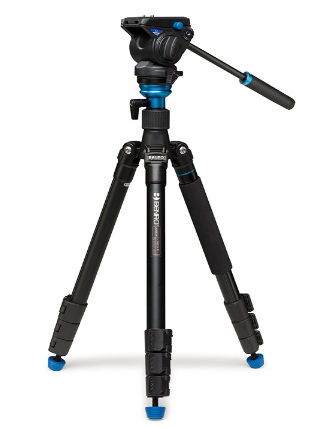 The top choice is the Benro Aero 4 Travel Angel Video Tripod Kit. 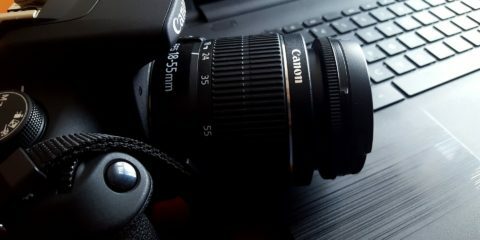 Not only will it work with most cameras, but it works with most video cameras too. It helps you take shots you never thought were possible. Finding a good tripod for taking on your travels isn’t as hard as you might think because the Benro Aero 4 Travel Angel Video Tripod Kit is the best tripod for travelers. The three-stage legs use aluminum to keep the weight down, which allows you to carry the tripod from one location to the next without any struggles. Benro provides you with a carrying case that can hold the tripod, the two sets of feet that come with it and any other accessories. Those feet are one of the reasons this tripod took the number one spot. You get a pair of rubber feet that have non-slip bottoms for keeping the tripod steady on a wet surface or any slippery area. The other pair of included feet has steel spikes on the bottom that you can actually spike into the ground for using the tripod in a muddy field or in another outdoor space without worrying that it will fall over. The three-stage legs have three rubber-coated grips that help you hold onto the tripod as you extend the legs, and you can actually extend just one leg or all three. These legs are also removable for using the tripod as a monopod. With its flat basehead, you can use this with nearly any video or traditional camera. Though Benro gives you a three-year warranty on this travel tripod kit, you can extend that warranty and get up to five years of coverage. All you need to do is visit the company’s website to register your tripod once it arrives. Thanks to the flip locks used on this Benro S6 Video Head and Aluminum Flip Lock Legs Kit, you’ll never again struggle to lock your tripod down before taking photos. Those locks, which you can see on the base of each leg, flip up and away from the tripod to let you adjust the length of the legs. Once you get the tripod to the height that you need, you can flip the locks back down and lock those legs to that height. A quick release plate on the top of the S6 keeps your camera or video camera from moving as you use it, but you can quickly pull your camera away from this plate when you want to take shots in a different way. We recommend the aluminum version of this tripod because it weighs less, but you can invest in an S6 made from carbon fibers instead. Both tripods come backed by the long warranty that Benro offers. The main reason the S6 missed out on our top spot is that it weighs more than the Angel. At nearly seven pounds, this tripod is a little harder to carry with you into the field or when you want to take shots outside your home. Its heavier weight and its locking legs make this a great choice for use in a standard location like a studio or anywhere else where you want to take still shots of people and objects. With a convenient shape, size and weight, this Benro Adventure 1 Series Aluminum Tripod w/ B1 Ball Head are one of the best Benro tripods for both professional and amateur photographers. 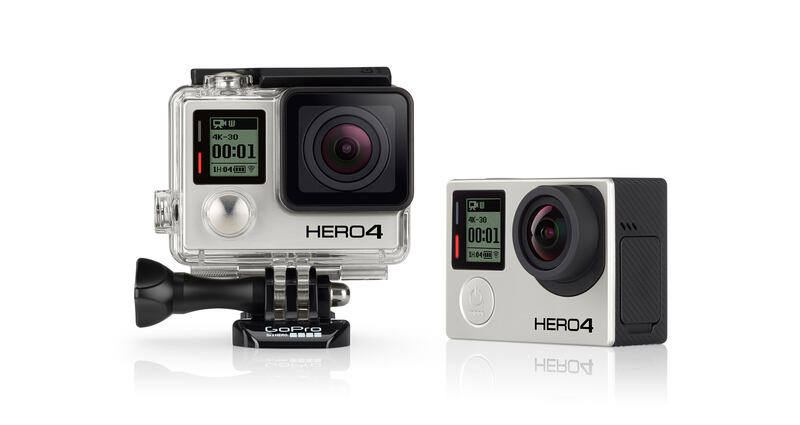 Though the Adventure Series 1 weighs only four pounds, it can support nearly 18 pounds of weight. Not only can it hold your camera without tipping over, but you can add some other weights to the center column for even more support. The three flip locks located on the legs of the tripod let you adjust the legs to reach your desired height. It measures just over 23 inches in its original state, but you can extend the length of those legs to reach a height of more than 60 inches. The flip locks are easy to release with just one finger or hand and snap back into place just as easy to secure the tripod. Though the Adventure Series 1 only comes with one set of feet, those feet are perfect for using indoors or out. The rubber used in the feet has a non-slip coating that keeps the feet from slipping and sliding across wet surfaces. Each one has a spiky design for securing in dirt or grass too. A ball head on the top of the tripod can perform three different actions. You can use the pan lock for panning shots, the drag lock when you need to move the tripod or the ball lock for standard shots. It has a quick release plate as well. 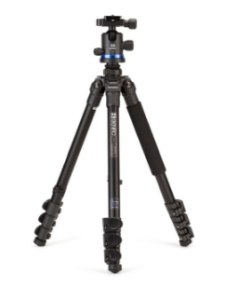 Benro thinks that shoppers will be so happy with their purchases of the IT15 iTrip15 Flip Lock Aluminum Travel Tripod Kit with Head that it offers a five-year warranty on the tripod. As soon as your tripod arrives in the mail, you can go online and register it. Benro will begin your warranty from the date of your purchase. This tripod has an aluminum center column that extends up to increase the total length of the tripod, which can help you better set up a photo shoot. It can extend itself to a length of more than 57 inches, but when you slide that center column down, it measures less than 15-inches long. The aluminum used in its construction brings the weight of the tripod down to less than three pounds, which makes it easy to carry. Designed for frequent travelers, the tripod has flip locks that are a breeze to use. You just flip the locks up to change the length and set up the tripod before flipping the locks down once you finish. It also has a ball head that can fit most cameras, a quick release clamp for fast removal of your camera and a design that lets you use it as a monopod or tripod. 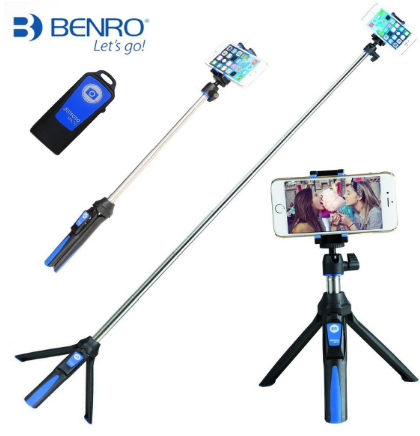 You might take one look at this Benro Hand-Held monopod and instantly realize that it doesn’t look like a traditional tripod, but we wanted to include it on our list because it allows you to make better selfies. Whether traveling hundreds of miles away from home, spending time with loved ones or seeing your favorite band in concert, you’ll want to take selfies to document the occasion. This monopod helps you take all the shots you want without others getting in the way. This monopod has a button in the center that you can press once to extend the length of the center rod, which lets you capture group shots and take photos of objects in the background. It also has a Bluetooth shutter button that lets you snap a shot via Bluetooth without struggling to reach your phone or camera. The selfie stick works with a number of smartphones from different companies as well as Go Pro cameras and iPhone devices. Though Benro calls this a monopod, it also works as a tripod. The handles on the side flip down to form legs that support the total weight of the device and your camera. Those legs create a tripod for taking still shots of groups, yourself or anyone/anything else you want to shoot. 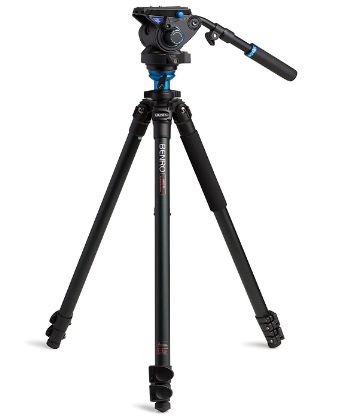 The best Benro tripod that we came across on our search is the Benro Aero 4 Travel Angel Video Tripod Kit. This tripod has a flat base on its head instead of the ball head that others have, which keeps your camera flush with the base and level with your surroundings. You can take all the shots that you want without missing people or the objects around you. Benro gives you two sets of feet that you can use, including a rubber pair for use on wet or slippery surfaces and a set of steel spiked feet that you can set into the ground to keep the tripod stable. The three-stage legs have rubber sections that allow you to change the length of one foot when working on uneven surfaces, but you can also change the length of all three. You get a three-year warranty that increases to five years when you register your tripod online. SHUTTERFEET.COM IS A PARTICIPANT IN THE AMAZON SERVICES LLC ASSOCIATES PROGRAM, AN AFFILIATE ADVERTISING PROGRAM DESIGNED TO PROVIDE A MEANS FOR SITES TO EARN ADVERTISING FEES BY ADVERTISING AND LINKING TO AMAZON.COM.